Monet loved her at first sight. She was devoted to him, clung to him like moss to a stone. And he was her rock, her anchor, the steadying influence in her life of tetter-totter emotions. Camille had, shall we say, issues. If she had been human, we would have suspected a bi-polar condition. 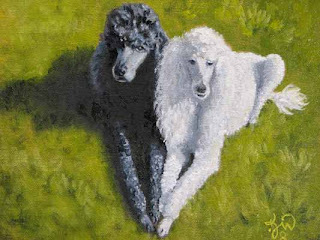 But she was a gloriously beautiful white standard poodle. And she well knew how gorgeous she was, and like a movie star, knew how to work it to her advantage. We dealt with her "issues" for her entire life. Resolved one or two, but mostly just learned to live with her idiosyncracies. Monet the Magnificent not only tolerated her oddments, he found her enchanting, her peculiaritys endearing. They were inseparable and when he died she almost died, too, of a broken heart. They had true love, written in stone. Now, together again, like George and Gracie, their love story continues on for all eternity. God has made no finer creature on the face of this earth than the Golden Retriever. 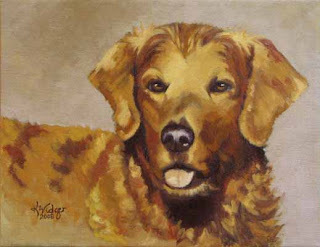 Hunting companion, kind-hearted and loyal beyond all reason; a dedicated retriever of any and every thing Master requests, from ducks to slippers. A most excellent Dog who finds his truest expression as Friend of Man. This kind and beloved face belongs to one who now awaits his Master on the Other Side. And his Master remembers him well, and in faith, looks forward to a happy reunion with his Ole Bud.